Robert Ames does not think in terms of labels. But when asked to describe the London Contemporary Orchestra, the group which he co-founded and of which he is co-artistic director, Robert says he does not see them as belonging to the classical world. 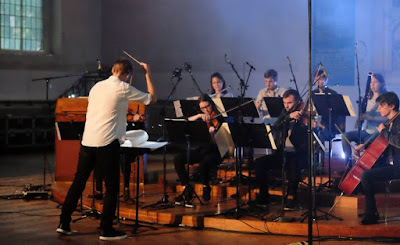 Robert and the London Contemporary Orchestra don't so much defy genres as ignore them, and their work is indicative of the very porous nature of contemporary music in the UK. 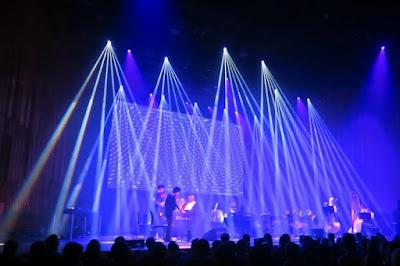 Robert's recent work has seen him touring with Jonny Greenwood (the guitarist from Radiohead whose work also includes a residency with the BBC Concert Orchestra), working with Frank Ocean, performing Steve Reich and Terry Riley, recording film scores and taking part in the South Bank Centre's Deep Minimalism festival. And for Robert all this is part of a single continuum of work. Robert is both a conductor and a viola player, and I recently met up with him to find out more about his work with the London Contemporary Orchestra, but we also talked about his musical contacts with India and Kazakhstan, were he explores another repertoire entirely. 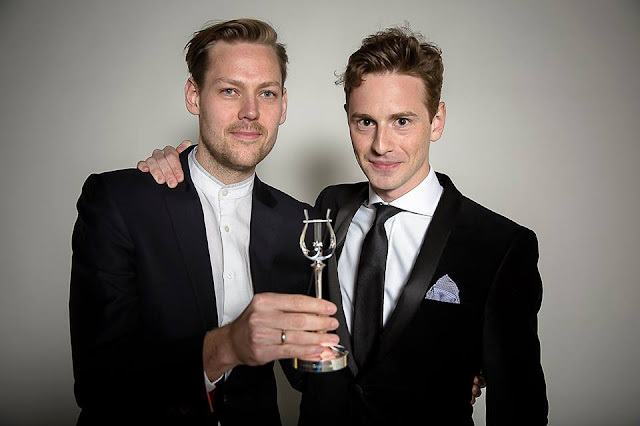 In 2015 the London Contemporary Orchestra won the Ensemble category of the Royal Philharmonic Society Music Awards and the judges' citation aptly convey's the orchestra's distinctive ethic, "London Contemporary Orchestra has become one of Britain’s brightest beacons for new music. 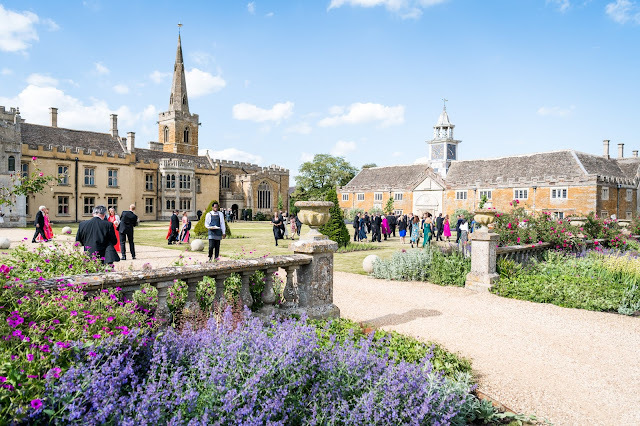 Its repertoire is adventurous yet it attracts sell-out crowds to extraordinary venues and has a remarkable online following. It nurtures new audiences, forges fruitful alliances across the stylistic spectrum, and champions challenging scores with virtuosic flair.". The orchestra deliberately has no specific residency, instead it tailors concerts to the audience but they have developed strong relationships with the South Bank Centre, the Barbican and the Round House. And their work this year will take them from collaborations with pop groups to big film scores. Rather than thinking in terms of labels, Robert and the orchestra put on music they believe in, which the audience can enjoy in its own way. 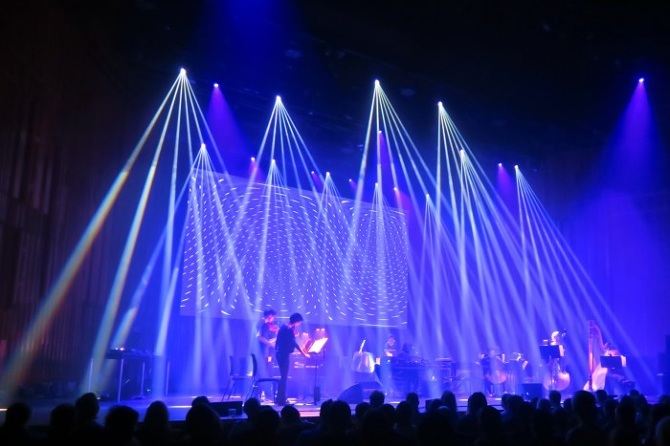 And it is quite an audience, with annual on-line figures of 2.5 million and having recently toured with Jonny Greenwood the orchestra's live audience was 20,000 this last year. In the new year, the group will be performing Tower of Meaning by the genre-bending New York cellist Arthur Russell (who died in the 1980s) at Kings Place as part of the Cello Unwrapped season. The programme has been co-curated by the cellist Oliver Coates, and represents the London Contemporary Orchestra's Kings Place debut. Also in the programme will be work by Mica Levi, and Mary Jane Leach. And they recently did a performance of Meredith Monk for BBC Radio 3, one of her rare instrumental pieces. Besides traditional concert halls, the group also performs in more unusual spaces. They will be giving a concert in the loading bay area of the Royal Albert Hall, where they will be performing music by Steve Reich, Michael Gordon, Mica Levi and Caroline Haynes, and recently performed a concert of Steve Reich's music at Edge Hill Station in Liverpool (as part of Reich's 80th birthday celebrations, when Robert also had to interview Reich, something he describes as terrifying). Robert explains that they enjoy going to raw spaces and building a programme around the spaces, which are blank canvases. For performances of Morton Feldman's Rothko Chapel at the Roundhouse (where Robert played the viola solo), the group commissioned some extraordinary visuals. As part of screenings of Paul Thomas Anderson's film There Will Be Blood, the orchestra will be performing Johnny Greenwood's score live. For these performances the conductor will be group's other co-director Hugh Brunt, and rather impressively Brunt does not use a click track but simply learns the music with the film. 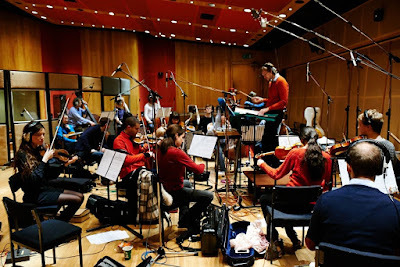 But then performing film scores with the London Contemporary Orchestra tends to be a far more collaborative experience than the traditional click-track work. The film is being toured to the Royal Festival Hall, Colston Hall, Bristol, Birmingham Symphony Hall and Brighton Dome. Anderson has collaborated with Greenwood a number of times, and has been known to cut his films to Greenwood's score (rather than the usual process of applying music to the pre-existing film). Robert finds the opening scene of the film extraordinary, it is the music which comes in first some time before the dialogue. When I ask Robert to describe Jonny Greenwood's score he says that he finds it hard to describe, and adds that he has a passionate dislike of programme notes. The London Contemporary Orchestra does not use programme notes, instead they want their audiences to just listen and make up their own minds. Robert feels that in concerts, when music gets to a difficult emotional moment, people will start reading the programme rather than engaging with the music. As well as his work with the London Contemporary Orchestra, Robert works as a conductor and a viola player with other groups, and has particular links with India and with Kazakhstan (the former Soviet republic which spans Central Asia and Eastern Europe). I was intrigued as to how Robert's link with Kazakhstan came about, and it turns out that his wife Galya Bisengalieva is Kazakh. She is a violinist, a State Soloist, and from a family of well-known musicians. 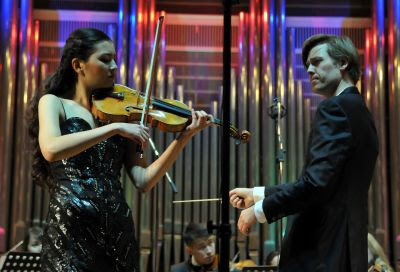 There is a tradition of Western classical music in Kazakhstan because of the Soviet era and Robert has found the Kazakh to be extraordinary musicians, with many of them trained in Moscow. Performing in Kazakhstan brings about a big change to Robert's repertoire. In the UK he concentrates mainly on contemporary pieces, but in Kazakhstan he has performed a lot of older English music, works by Elgar, RVW and Holst, many Kazakh premieres. He admits to loving this repertoire, and recently performed the solo viola part in RVW's Flos Campi in Kazakhstan. The audiences are always good, and every concert he has ever done in Kazakhstan has had a full audience and amazing energy. Robert comments that it is a very different world, in Kazakhstan a visit to a concert is very much a night out and the members of the audience all dress up, which makes a very different context to his work in London with the London Contemporary Orchestra. In India he works with the Symphony Orchestra of India, music director Marat Bisengaliev, chairman Khushroo N. Suntook. This is the only professional Western classical orchestra in India, whose home is the National Centre for Performing Arts in Mumbai, a space which includes a symphony orchestra auditorium, chamber music recital hall, theatre and an experimental theatre space. Robert originally simply went out to play with them, but now goes back to work as a conductor. The orchestra currently supplements the personnel with European players, but they are building up the number of Indian players. Last time Robert was in India he was working with the string orchestra and around a third of the players were Indian, and this is growing as numbers have improved each time he goes out there. The orchestra also has an amazing youth programme, which is celebrating its 10th anniversary, which means that the first young players from the programme will soon be ready to join the main orchestra. In India, the orchestra plays mainly Western classical music but on a recent visit to Europe, playing in Geneva they played Indian classical music too. 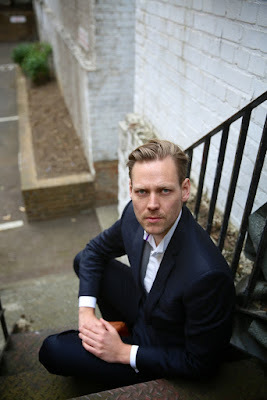 A lot of Robert's work with the London Contemporary Orchestra is collaborative, where they take people from outside the classical world and introduce them to the amazing things that an acoustic ensemble can do. So when Robert is in India, he enjoys collaborating with Indian classical musicians and Bollywood musicians too. Robert still splits his time 50/50 between conducting and playing the viola, and hopes to keep things this way as he feels that one informs the other. He sometimes directs from the viola, and did so for a performance of Terry Riley's In C at the Barbican in September 2016.. He started by learning the viola, and eventually moved to conducting. But he conducted the school orchestra when he was 13, commenting that he nagged his teachers to death to be allowed to do it, and afterwards they continued to encourage him. So conducting was always in the background. Though he studied viola at the Royal Academy of Music, he took classes in conducting too. 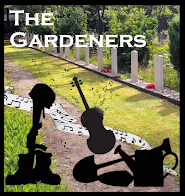 But he feels that the best way to learn the craft of conducting is to watch it being done, and there is nowhere better than sitting on the front desk of the violas. Though he does not do much ensemble work now, he mentions leading the violas for Birmingham Contemporary Music Group when Oliver Knussen was conducting as being the best way to learn. 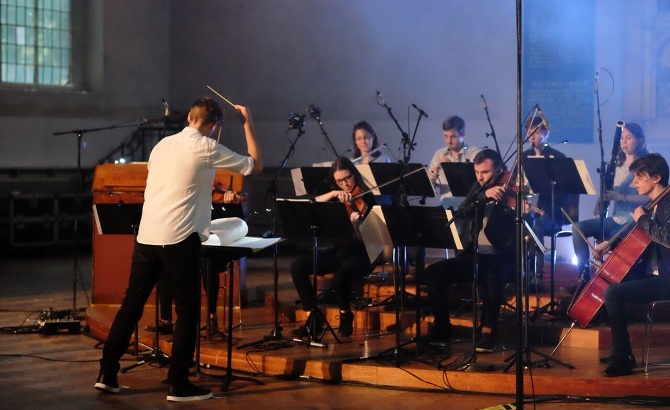 The London Contemporary Orchestra is not a symphony orchestra in the conventional sense, but rather a collective of musicians and they could easily programme a string quartet followed by a symphony. Working in the ensemble is very much a collaborative experience as many of the instrumentalists are also composers, improvisers and produces, which makes for an amazing rehearsal experience. Robert thinks that the world of the dictator conductors is no longer the world we live in. 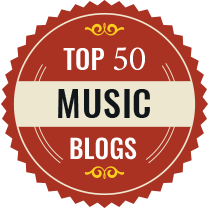 With the London Contemporary Orchestra the majority of musicians are under 30 and the level of musicianship is very high, and whilst the rehearsals are not a free for all there is far more debate than is usual. And when they perform in smaller groups the process is even more open. The advantage of this collaborative process is that it gives the musicians a sense of ownership in the concerts, and Robert prefers an environment where people feel they can collaborate and contribute. 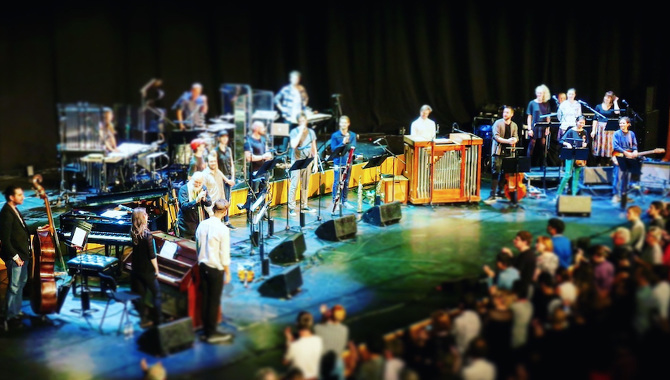 London Contemporary Orchestra performs Arthur Russell's Tower of Meaning at Kings Place on 14 January 2017, performs There Will Be Blood:Live at the Royal Festival Hall on 30 January 2017 and performs in the Royal Albert Hall loading bay on 4 March 2017. See the London Contemporary Orchestra's events page for a full list of future events.